Hello everyone! 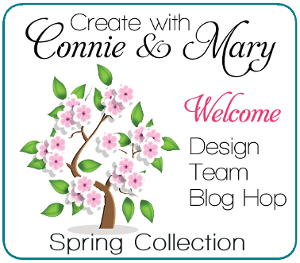 Welcome to the Create with Connie and Mary Spring Blog Hop! I am your stop after the fabulous Debbie Henderson. She is always such an inspiration! I can't believe that we have come to the end of the Spring Collection! I hope you have been inspired by all the fantastic projects that have been shared! If you want to see them you can still sign up and see all the ideas that have been shared. Just visit the Create with Connie and Mary site to find out how to sign up. 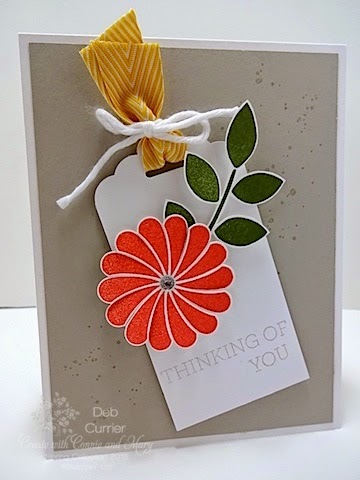 This past week I used the Crazy About You stamp set on the Spring Collection. I love this set with the all the words and a few images as well! A lot of stamps for the money! I went with a simple layout and some bright colors! Cut a piece of Sahara Sand at 4" x 5 1/4"
Time to send you on to the awesome Connie Babbert! I know you will be inspired by what she has to share! Thank you so much for being a part of the Spring Collection! We really appreciate you! Have a super day!